Van Newkirk, Oshkosh, NE, was named the 2018 BIF Seedstock Producer of the Year. 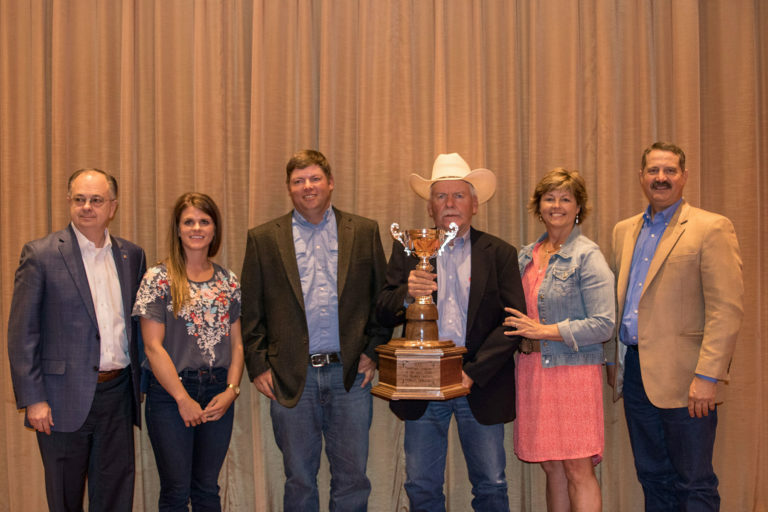 Pictured are Steve May, BEEF magazine, award sponsor; Sara, Kolby, Joe and Cyndi Van Newkirk; and Donnell Brown, 2017-2018 BIF president. Photo credit Angie Denton. The 2018 Beef Improvement Federation (BIF) meetings were recently held in Loveland, CO, with over 600 people in attendance. This year’s meeting marked the 50th anniversary of BIF. With this milestone came an opportunity to reflect back on accomplishments made and given thought relative to the direction of activities going forward. One opportunity that was raised throughout several talks during the meeting was the need to collect phenotypes that are economically relevant but have largely only been collected in research settings. Examples include animal health, healthfulness of beef products, and sensitivity to environmental stress. Other phenotypes such as routine carcass data and female fertility have some available EPD, but additional phenotypes are critically needed. Discussion of the need to collect these data and the need to engage other sectors of the industry (commercial cow/calf, feedyards, packing plants) in genetic improvement of beef cattle was clearly identified as a priority. Dr. Dorian Garrick clearly outlined a listing of traits that should receive focus going forward in his talk entitled Focus On Traits Not Considered. In his Thursday morning wrap-up talk, Dr. John Pollak clearly charged BIF with the task of bringing new ideas relative to novel traits to fruition as the organization outlines goals for the next 50 years. Several talks highlighted accomplishments of breeds that have now released “single-step” genomic evaluations for the first time. Interestingly there was much discussion on shifting organizational focus to help make selection decisions simpler. One such talk was from Dr. Jason Archer who discussed a project in collaboration with the American Angus Association to combine economic modelling and survey information to inform selection index development. As usual, there were several informative talks at the annual BIF meetings. Recorded talks can be accesses at http://www.bifconference.com. Proceedings papers are available at http://www.beefimprovement.org. The 2019 BIF meetings will be held in Brookings, SD, June 18-21.